“Today we are in Big Valley, vast plain that you do not see the end. A sea and barren wasteland from which emerge the only trees that can reach the water: the baobab. More we delve more desolation reigns: here is just dust and scorched earth. For crops expect summer rains, when the scorching heat, which reaches 50 °, kills. I wonder how they managed to survive before the NGOs they built hand pumps for water … kilometers and kilometers in search of water holes and streams. We crossed traces of rivers that seem to be always dry. We arrive at the “clinic”, full of mothers with babies on their backs come from far away that they can not do HIV testing because they lack the reactors. They are educated on basic hygiene to prevent HIV, cholera and malaria … “. It was on August 6, 2006. Since then, the “clinics or rural health centers”, often cabins with a tin roof and a volunteer who awaited the arrival of the jeep weekly hospital, have improved but there is still much to do. – Life expectancy: 51 years (in 2007 was 37 – in 1990 was 63 years). – More drastic increase in infant mortality in the world: 50% of annual deaths more than in the early nineties. One in ten children die before their fifth birthday. – 90% of the population lives below the poverty line of $ .2 per day. – In 2009, inflation reached 5 billion% (the second highest in the world was Ethiopia with 236%). The local currency has collapsed and the savings of the population lost. – Unemployment: 95% (in 1998 it was 45%). – Electricity for a few hours a day. – Along with Azerbaijan, Yemen, Kazakhstan and Bahrain he topped the world rankings of the level of corruption. – It also reached the summit of the most repressive regime in all of Africa. If we add: the severe state of malnutrition – in the dry season drought comes to reduce to one meal every two days – access to water is often several kilometers – in the last three years, 60% of the pumps (manual) went out of order due to lack of maintenance -, respiratory diseases, lack of vaccines, malaria out of control and AIDS which affects 14.7% of the population (in 2004 reached the summit of the world 25.6% ), we understand why Zimbabwe is one of the country with the most need of help in our planet. The experience at the hospital in St. Albert led the writer to become a promoter of a project that cheaply (for us Westerners) is changing lives, or should I say, the is allowing thousands of people. The village of St. Albert is located in a rural area in northern Zimbabwe. A few houses, a school which is attended by 1,700 children / kids and the hospital with three local doctors and 26 nurses have to cover an area of expertise of 2,744 sq km., Mostly groups of huts, with an induced 119,170 inhabitants. Electric power is present, as in the whole country, for 2.4 hours without notice, the telephone line is interrupted for years and drinking water in the dry season (March-November) was available a few hours a day. In these conditions, in 2011 the hospital received 6,530 inpatient and 3,330 shares (of which many Caesars, mothers give birth in hospital without problems) as well as an average of 393 people a day assisted nell’ambulatorio. 60% of patients are infected with HIV (all are tested). In 2007 he opened a nursing school which now has 61 certified nurses and a vocational school for orphans whose parents died of AIDS. Thanks to prevention in the district hospital of competence AIDS fell from 23% to 7% over the past 10 years. Hospital are part eleven “rural health centers” located in the immense valley of the Zambezi (among the most depressed areas of the country), with climate scorching heat. They are mostly devoid of electricity and some with water. It employs three local nurses who receive a kit with bandages, disinfectants and pain killers along with a few bags of maize to cope with the most severe cases of malnutrition. Most of the children are orphans, and thanks to the sponsorships will ensure their health care, one meal a day at the school canteen and Education (see document sponsorships). The dependence on humanitarian aid is total. Due to the lowering of the water table, six of the seven artesian wells at the hospital in the dry season were dry and the water was only delivered three times a day. The hospital service accused serious consequences hygiene. To ensure the supply of water and food in 2004 was made within one kilometer from the hospital, near a pool of water, a small dam that allows you to retain water collected during the three months of rains for use during nine-month drought. 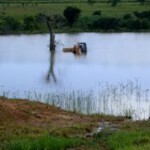 The work had not been completed because of the failure of the excavator which in 2006 was still left with the tanks underwater. The plumbing did not reach the hospital and the water is not drinkable you could not drink. Only irrigated fields surrounding the dam. With the aim of solving these serious problems in September 2006 was born on Dam Project which over the years have joined many volunteers both in the technical field that for fundraising. Work began in early 2007 and in August 2007 was completed the digging of a canal and enter the pipes (1 km) that bring water to the settling tanks and tanks of the hospital. Providential because in September 2007 has dried the last artesian well and the hospital, the two schools and the population would be left without water. However, the dam water is not drinkable. We then proceeded to the immediate purchase of a plant for potable water adduced by the dam. With the funds raised has been able to buy a small plant that from November 2007 has ensured sufficient water for 500 people. The whole village had yet to 3,091 people (including 1,700 children), so we needed a second water treatment plant. In November, it has been installed a generator capable of ensuring emergency power at times when there was no government provision. However the consumption of diesel fuel is very expensive. In 2009, thanks to personal donations, to the work of the many friends who have organized banquets, shows, dinners solidarity … and promoted the Dam Project to raise funds and voluntary work of engineers and technicians, it has been designed, built and tested in Italy the second water treatment plant. To avoid installing a system that could be insufficient within a short time due to the increase of population subsistence, it has been designed and built a system able to ensure safe drinking water to over 10,000 people. In February 2010 the plant was delivered and installed at the hospital. Those interested in the technical details can contact us or read the thesis laura Eng. Fabio Venturini published on our site. 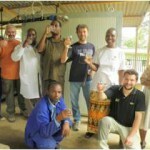 In February 2011, tests have shown high quality (with a fixed residue lower of St. Benedict sold in the West). 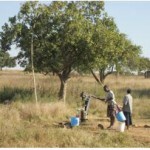 In June 2011 it was extended the irrigation system in 8 hectares of fields to ensure the subsistence food. During 2012, work continued in the training of maintenance personnel, technical material sent hospital and drugs. In 2013, five wells have been restored, was appropriate part of electrical and replace the main pumps of water supply from the dam. It was finally decided to have it permanently on-site technician to oversee the work and form the local maintenance. First 3 months of Gabriele Gamberoni. 2014 began with a storm of lightning that burned the electrical boxes governmental leaving the region without electricity. On January 19, he left again Gabriele Gamberoni who repaired the fault and for another 3 months has worked together with local maintenance. Meanwhile engineers Hammers and Christmases in Italy have worked on the design of new electric hospital. 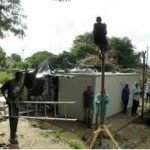 In the months after it has obtained the necessary materials (electrical panels, cables, corrugated, accessories …) and in August started the container (also with reconditioned hospital beds abandoned by our hospitals). In November came the container but because of the outbreak of Ebola (not in Zimbabwe, but to the airports of transit) we opted to postpone the departure of 5 Our technicians. Due to the delay of the rains maintainers premises, following the directions of the engineer. Hammers, are lengthening pipes taking water to the pump in the dam that has almost dried up. So go ahead, albeit with difficulty. Continue the vital work of training of maintenance personnel, sending half-year container with medicines, technical material, books and school supplies, clothes and shoes for children … and alas, even food. The goal is to make the community of St. Albert self-sufficient. In August 2008 in Zimbabwe cholera epidemic that broke out in March 2009 (8 months) he had infected more than 96,600 people of which more than 4,400 have died. These official figures. South Africa despite closed borders, has recorded over 2,000 cases of infection because of illegal immigrants fleeing. It was the worst outbreak in 15 years across Africa. The entire national health structure has collapsed, more than 80% of state hospitals have closed, leaving the rotting corpses in the mortuaries. The situation was catastrophic, the World Health Organization has predicted that it will take years to bring it back to a state of normalcy. A massacre in which virtually no one, at least in Italy, knew nothing. The hospital in St. Albert welcomed sick from many other regions due to the closure of hospitals and, thank God … and all those who helped to bring purified water in St. Albert, the whole district of Centenary was by far the least affected (160 infections and 19 deaths) and the hospital “” “only” “” eight dead. This can make clean water! 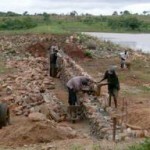 To implement the first part of the Project Dam including the second water treatment plant, in addition to all the work of the volunteers, they had been spent €. 178,000. The cost of a luxury car in the West and the survival of thousands of people and future generations in Zimbabwe. The future of the dam project involves the renovation of the electrical system of the hospital, the construction of houses for the two doctors and staff management, in addition to maintaining the structures built and the continuous training of the maintenance personnel of the dam, the installations and lines of water and electricity. Accomplish the goals we have set ourselves with the dam project is to put the health facility in St. Albert in a position to be independent in terms of water and food, to significantly improve the conditions of hygiene and allow to cultivate and nurture even the surrounding villages. For the Project Dam was opened a bank account transparent (we allow anyone who wishes to verify the movements directly through bank statements). The outputs are exclusively related to the project. No expense or organizational management. Work for fundraising is all voluntary and the cost of the volunteers! The current account is payable to ASI, the tiny sorority whose three medical missionaries run the hospital in St. Albert. It is a dedicated account, exclusively for the Project Dam and operated only by me, Marcello Daloli Group, promoter of the Project Dam. Anyone who wants to get clarification can contact me. Also the modest size of ASI allow anyone to create a direct relationship with the reality of the hospital and follow the Project Dam or sponsorships of children in schools in poorer areas. While being a group of volunteers, it ensures total transparency and the absence of expenses, on the other hand, not having behind large humanitarian organizations, it is not easy to raise the necessary funds. The only way for us to raise awareness of what we do is word of mouth. If you write to me via email and I will update you can help us promote the meetings that I hold periodically in various Italian cities where, with the help of projections, present the Project Dam. I conclude by thanking our volunteer doctors, nurses, patients, teachers, children … of St. Albert and the Valley for giving us this wonderful opportunity to … be happier. 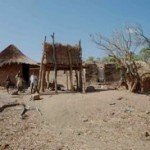 I invite you to visit our website www.help-zimbabwe.org, where you will find documents, pictures and videos that tell our great little enterprise. (The amount of donations can be deducted from taxes). 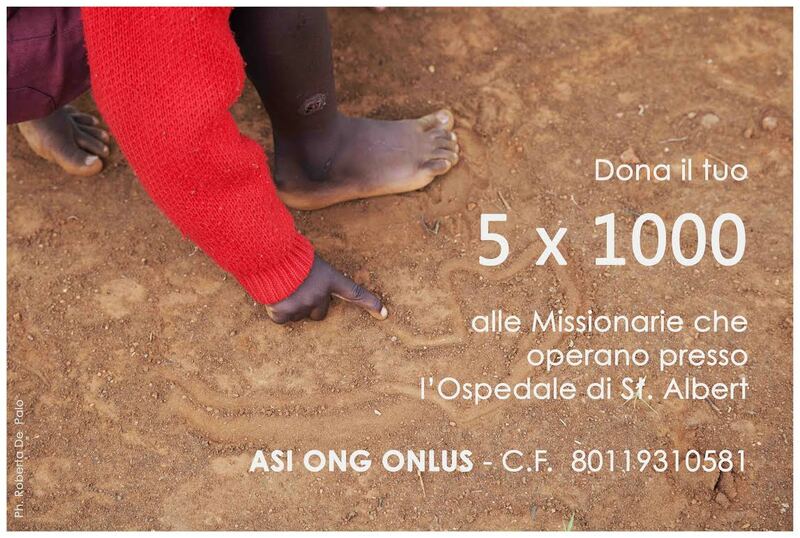 Clicca sul logo PayPal per fare la tua donazione direttamente su https://www.paypal.me/StAlbertHospital associato all'indirizzo marcello@help-zimbabwe.org. l governo non passa quasi più nulla e anche le associazioni umanitarie internazionali hanno ristretto gli aiuti per carenza di fondi. Nonostante l'acquisto farmaci non faccia parte del "Progetto Diga", abbiamo deciso di contribuire con €. 10.000 per sopperire alla grave carenza di farmaci all'ospedale. L'8/3/2016, insieme a Rock No War, abbiamo emesso l'ordine a Medeor (Germany) che ha subito spedito e dovrebbero arrivare a St. Albert a fine maggio. E' possibile effettuare donazioni facendo un bonifico sul seguente conto corrente IBAN: IT16Z0538713009000000016000 intestato ad ASI ONG/ONLUS Per l'estero cod. swift: BPMOIT22XXX L'importo delle donazioni è detraibile dalle imposte. Per la tua donazione con PayPal clicca direttamente su https://www.paypal.me/StAlbertHospital associato all'indirizzo marcello@help-zimbabwe.org. Il progetto "Help Zimbabwe" si basa esclusivamente sul volontariato, senza alcun addebito di costi di gestione o spese organizzative. Ogni euro donato è speso per la realizzazione del Progetto. Le donazioni sono gestite attraverso un conto corrente trasparente, in modo che chiunque ci aiuti possa verificare l'utilizzo dei fondi. Le modeste dimensioni dell'ASI, che con 3 medici locali gestisce l'ospedale si St. Albert, permettono a chiunque di verificare la trasparenza dei progetti. Solo attraverso le adozioni a distanza l’ospedale è in grado di garantire la sopravvivenza, l’istruzione scolastica e l’assistenza sanitaria dei bambini nell’area di St. Albert affidandoli, dove possibile, a nonni, zii, o a famiglie che possono accoglierli, senza così creare orfanatrofi. "La mia più grande ambizione è che ogni bambino in Africa vada a scuola perché l'istruzione è la porta d'ingresso alla libertà, alla democrazia e allo sviluppo" (Nelson Mandela).